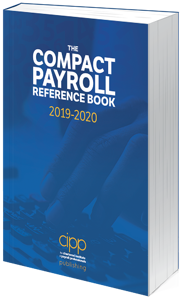 The Compact Payroll Reference Book is now owned by the CIPP has become yet another incredible membership benefit for associate, full, fellow and Chartered Members. The Compact Payroll Reference Book includes current tax and National Insurance tables together with as much information as is likely to be required during the tax year. The book also contains many historical tables and information enabling reference back up to 20 years. The Compact Payroll Reference Book aims to provide as much information as possible in one volume. It includes definitions and up to date information about statutory deductions, statutory payments and state benefits. Also included in the book are guidelines, details of helplines and publications as well as appendices covering useful addresses, websites, forms, student loan tables and leaflets. The appendices also include the 2016-2017 tax tables and National Insurance tables. Associate, Full, Fellow and Chartered Members will be sent the book as part of a tax pack free of charge. The book is also available for purchase at £40 plus postage so if you would like a copy of the book please email info@cipp.org.uk to register your interest. Please note there is currently no launch date for the 2019/2020 new benefit, but members will be the first to know when new details are announced.